Did Your Kid Visit The Dentist For The First Time Already? While it can seem daunting to take a testy toddler to a dentist appointment, it’s essential that children as young as one have their teeth assessed to catch any early concerns. Typically, these visits are usually short and involve little treatment. But getting a jump start now can save you time and the expense of having to be referred to a pediatric specialist or surgeon if specific issues go undetected. It is best that kids see a dentist by the time they turn one. Then twice-yearly after that. Regular visits combined with the right home care will keep their teeth pearly white all through childhood. Remember, for toddlers; their first visit can be a scary adventure. Weird instruments, lots of loud noises, and new people can rattle even the most laid-back 2-year-old. However, with careful preparation maybe some bribery, a first trip to the dentist can be fun. Besides checking your child’s teeth for any concerns and discussing the proper cleaning methods, it’s important to get your child used to healthy oral hygiene habits. 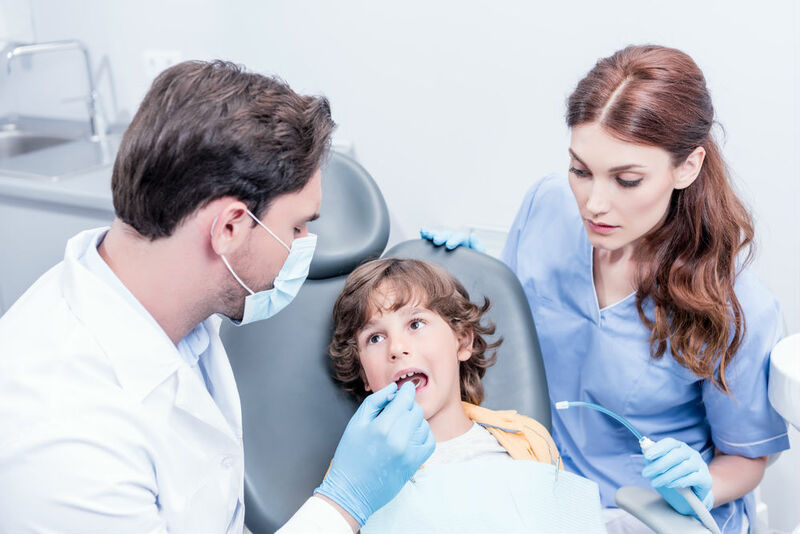 Getting them started now with the proper dental care routine, will ensure they continue taking exceptional care of their teeth well into adulthood. Your child my only have a gummy grin studded with just a couple of freshly sprouted teeth or showing off a mouthful of pearly whites, regular dental care with a dentist they are comfortable with will help build their confidence with their dental visits. We recommend seeing children every six months to help them get used to going to the dentist. Try these healthy at home tips to keep your child on the path to a bright smile. Curb sucking habits early. They lead to crooked or mis-aligned teeth and possible overbite. It’s best to help your toddler brush after breakfast and before bed and recommended by the American Academy of Pediatric Dentistry children under eight brush with guidance from parents. Pick a soft, kid-size brush. Swap with a new brush every three months. A pea-size amount of toothpaste on your child’s brush is plenty. This amount is adequate fluoride and will prevent fluorosis, a possibly damaging oral condition caused by over-ingestion of fluoride. Avoid starchy and sugary snacks. They will stick to teeth and increase the risk of decay. If your child is not able to brush, rinse their mouth with water to wash away food particles and sugar. To learn more about children’s dentistry, visit our website or call us today. At Heron Park Dental, our primary goal is to provide you with the very best in preventive, restorative and cosmetic dentistry combined with the highest level of customer service.